I just discovered, almost too late, that it’s Squirrel Appreciation Day! This entry was written by whyevolutionistrue and posted on January 21, 2018 at 2:00 pm and filed under squirrels, Uncategorized. Bookmark the permalink. Follow any comments here with the RSS feed for this post. Both comments and trackbacks are currently closed. Do you name your visiting squirrels? Mine are eating suet packs put out for the birds. I am sure the Sqrlz truly appreciate the stomach- (and store-) filling efforts of the Great Nom God In The Office Window. At least while the noms keep coming. If there were a Sqrl-Eris, I wonder what would get engraved on the Golden Peanut, before chucking it into the meleé? “For the Nommiest”? Cheapest food to put out for the squirrels is corn. Some retail stores will charge way too much but remember – the farmer sells it today for about $3.50 a bushel. That is roughly 60 pounds of corn. My squirrels won’t eat corn–either the dried type or off-the-cob type. They reject it entirely. I have not seen that before. We are talking field corn, not sweet corn? Also, I’m sure you know this, after a squirrel eats corn most of the corn is still there. They only take the center out… After they strip corn off of a cob, if you give them cob and all, there will be corn all over the ground but the good stuff is gone. I know this sounds stupid but maybe because they are city (Chicago) squirrels they have never seen corn? Or city squirrels have access to more highly desirable food as commonly found in human trash. We are having a big snowstorm today and all the squirrels are tucked into their homes and out of sight. I’ll make up for missing Squirrel Appreciation Day by putting out a double helping of peanuts tomorrow! Need to write on the back too – how are the squirrels supposed to read that sign? You don’t want to mess with squirrels, just ask rick and morty! Thanks for the idea about getting some raw dried corn. I’ve been buying lots of unshelled, preferably raw and definitely unsalted peanuts and some occasional fancy unshelled nuts for my outdoor pets. Because like PCC found out when they broke into his nut stash, they’ll take everything that’s there if you don’t ration it out some and it can get expensive. I’m a big squirrel fan but I totally forgot that yesterday was Squirrel Appreciation day! I put extra nuts out this morning to make up for it. Very pretty squirrel. 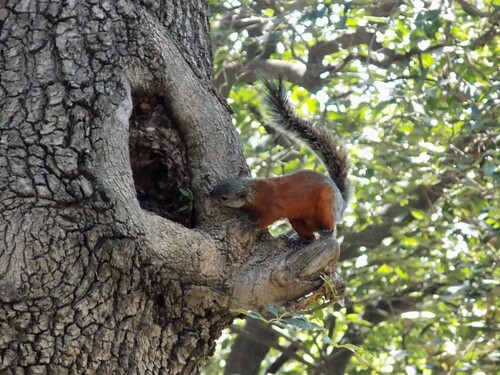 I think it’s a Variegated squirrel (Sciurus variegatus) from Central America.